The leftovers have been put away. The dishes have all been done. Thoughts are turning away from giving thanks and toward shopping, sales, decorating, holiday parties, the next family gathering and the birth of a babe. Many of us ventured out to shop and spend today; the holiday music was blaring at every turn, and the colors of orange, brown, yellow and sienna overwhelmingly made way for the red, green, silver, gold and white. A few days ago, I wrote a post on my Facebook page about how America was looking forward to putting a capital “T” on Thanksgiving and celebrating with family, food and fellowship. In that same post, I reflected upon living a 365-life full of “t,” where the joys of our blessings are felt and radiated outward no matter what the day or circumstances. The season of thanksgiving is still upon us, or, at least, it should be. When we live a life full of thanks-giving for our blessings, we have a peace, hope, joy and abundance which permeates our relationships, our careers, our fellowship and our walk. Being filled with thanks-giving is not something that comes from what happens to us from the outside-in, but it is something that fills us from the inside-out and spills over into every aspect of our lives. 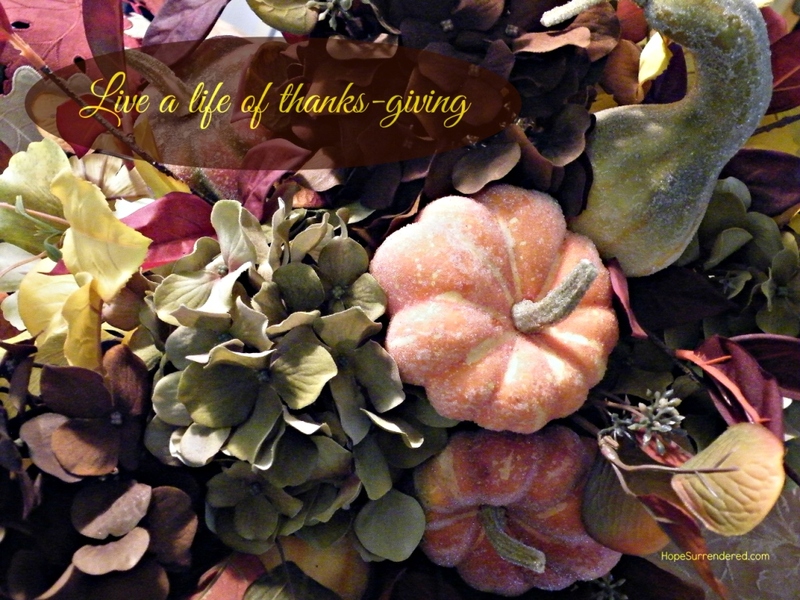 Today, as we find ourselves mentally, physically, monetarily and spiritually getting ready for the next holiday, let’s make our thanks-giving the primary focus of our preparations and the days to come. The gifts we both offer and receive from that joy will be multiplied! Yes, you are right. I haven’t posted much in the last few months. I’ve been on a journey…a journey of silence. I felt Him calling me to “Be still…” (Psalm 46:10) and just listen to where He might be directing me. …learned from Him in wisdom that when He calls us to be still, what He often doesn’t say as He allows us to hear Him can be just as powerful as what He does say when He allows us to hear. I have a daily calendar on my desk from Dayspring. It’s an (in)courage calendar titled, “home for the hearts of women” — they use a lot of lowercase letters, so pardon the lack of capitalization, but do click on the links and visit them! 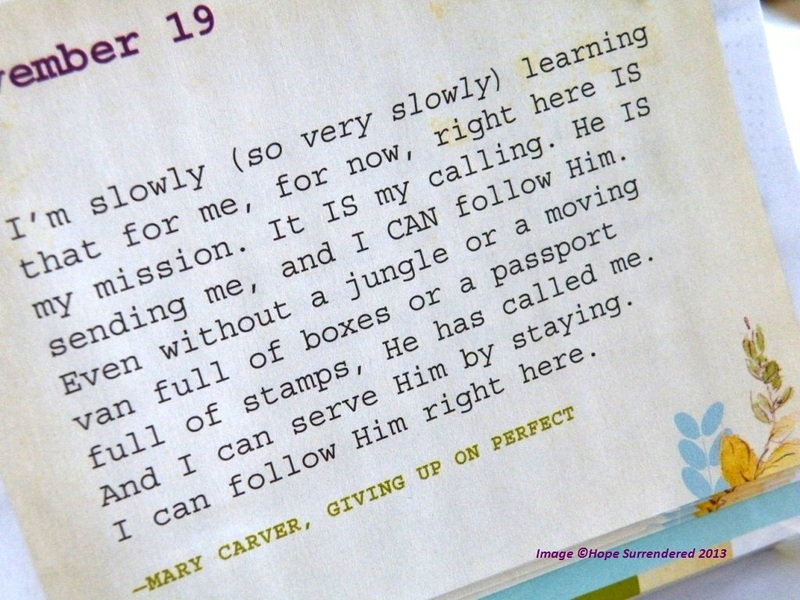 A few days ago, I felt moved by some of the sentences posted by Mary Carver of Giving Up on Perfect. Mary’s words stared at me as I stared at them, and it was yet another leading and confirmation for me about where I am being called. The Lord often does that…He often gives us some kind of confirmation to affirm what he’s already told us. “I’m slowly (so very slowly) learning that for me, for now, right here IS my mission. He IS sending me, and I CAN follow Him. Even without a jungle or a moving van full of boxes or a passport full of stamps, He has called me. And I can serve Him by staying. I know He has called me to write as Hope Surrendered…here on this dot.com, on my Facebook page and on Twitter, too. (I’d love to have you follow me in those places. The links are above on the “Contact me” tab if you wish to do so) I haven’t questioned the calling, but I did question the timing of it. Wouldn’t you know? He did have to give me a big push before I got started, and yet another one to take this step! I have felt led to take a step away from here over the last few months to question, ponder and pray about just WHO He was calling me to be on these pages. My journey has been about surrendering MY OWN hopes to Him. It’s been about knowing and trusting that whatever my own hopes have been, are or will be, they are absolutely nothing if they are not also His. He knows the desires of my heart, but the journey of Hope Surrendered has been about me surrendering those desires to seek His will and His way so that I might know His desires. The journey has shown me that when my desires line up with His desires, he will grant me the desires of my heart. The journey isn’t over, and I still have a lot of work to do in accomplishing this, but Mary’s words on that calendar reminded me of being conscientious of working on His timing, in His ways, and through His calling. The silence of being still which I’ve experienced over the last few months has shown me what I believe is His desire for me to be more authentic in who I am. In my day-to-day life, I do feel I’m pretty authentic. The Hope Surrendered you’ve gotten to know a little has been very authentic with you on these pages, but she’s been holding back…holding back in the sense that those who know me in my day-to-day life don’t know about Hope Surrendered. I feel as though He’s calling me to change that. From the many emails I’ve received from you, I know that some of you have found a kind of hope in reading Hope Surrendered, and I thank you for reaching out to me. I want to continue to provide that for you through my writing about how the Lord has been leading me, and the time has come for me to prepare to also let my friends and family in on how I’ve found that kind of hope, too. I’ve told a few people in the last few days, and the response has been wonderfully supportive. I’m realistic enough to know this won’t always be the case with my family, friends and acquaintances, but if I’m doing His Will and traveling the way He would lead, then He will also equip me to deal with the not-so-positive responses, too. He has and is calling me to serve by doing what I’m doing right here on these pages, but even more so, He has and is calling me to journey on a path through life with Him. For that I feel blessed and grateful! It’s a breezy day today where I live. As I’m working at my desk, leaves are fluttering in the air and blowing across the yard and the meadows. 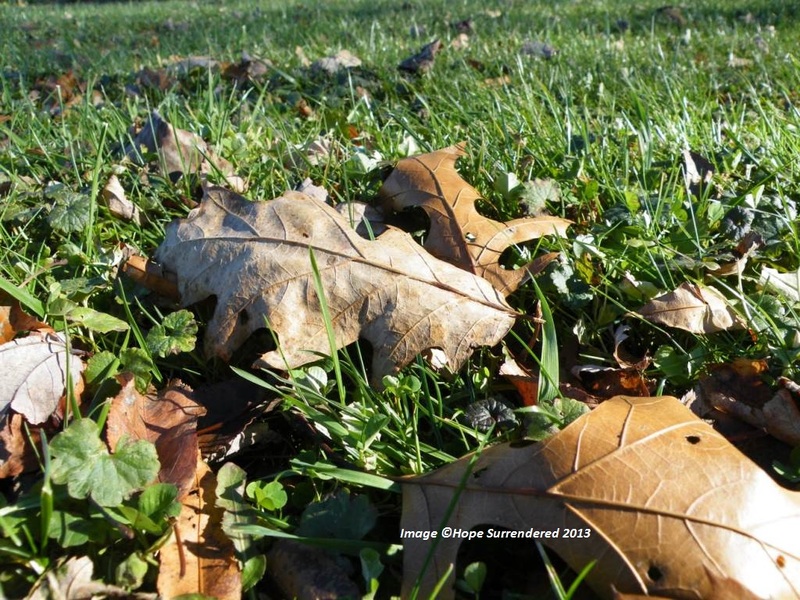 It’s nice to not have to rake those leaves into neat piles or gather them to dispose of them elsewhere. I often wish the challenges of life could just blow away like the leaves, but instead, they usually have to be dealt with directly. The leaves are dead, but challenges can bring us a life-giving perspective when we learn from them and see the possibilities about how they can be worked for our good. 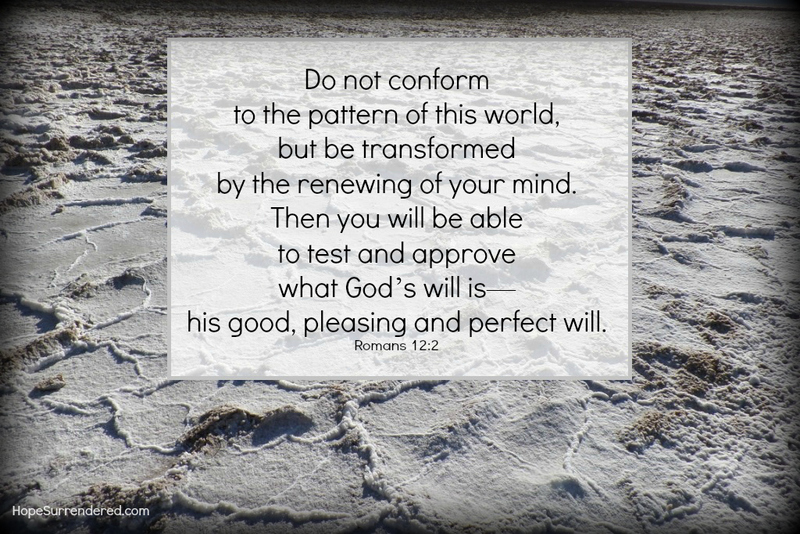 If a challenge has been permitted in my life, I know—in faith—that He intends to use it for my good and for His good. I also know—in faith—that blessings will be found.